An interesting paper in « Case study in Engineering Failure Analysis » published on ScienceDirect.com. 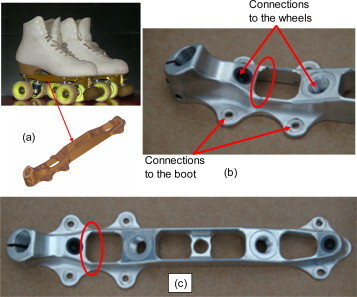 This paper dealt with the analysis of a novel chassis for figure roller skates, made of P-AlMgSi alloy, which experienced a premature failure. An integrated approach had to be used to overcome the several criticalities of the study. The research led to the individuation of the primary cause of failure, standing in bending fatigue, due to the high number of jumps (i.e. : fatigue cycles) being performed during figure skating training. A solution to the problem was suggested, which led to an improved and optimized project of the chassis with positive outcomes (from the technical and mechanical points of view) in its use.